The genus name, Hypericum, comes from the Greek words hyper meaning “above” and eikon meaning “picture” from the old custom of hanging Hypericum flowers above a picture to ward off evil spirits at the Feast of St. John, which took place at the time of the plant’s blooming. This resulted in the plant’s common name of St. John’s-wort. 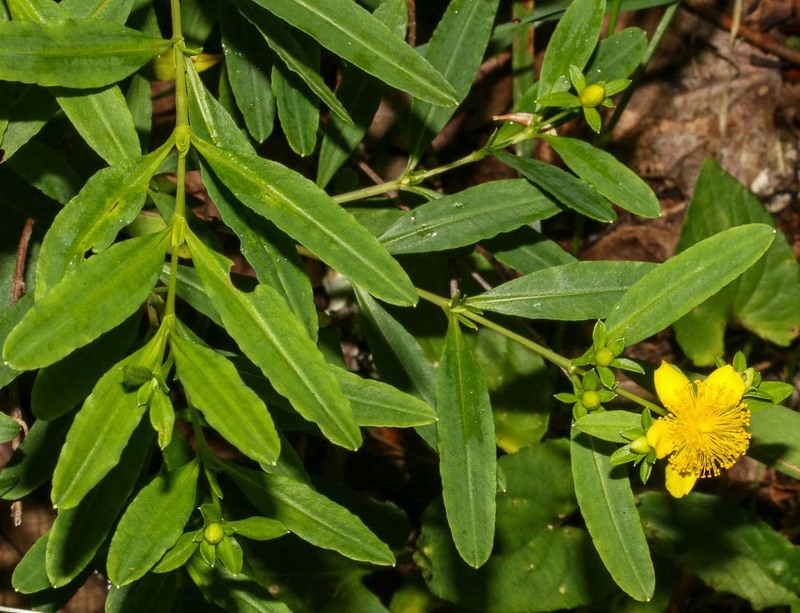 Our plant’s list for Parkway South includes 7 different Hypericum species; most are found at Wolf Mountain Overlook. Differentiating between some of them is difficult, so we’ve tried to come up with an aid. Our photographers have provided pictures and we’ve included brief descriptions, so that next time we visit we can hopefully identify the different species. Note: herbaceous plants are annuals or perennials that die back each year; a woody shrub continues growing, thus its stem increases in diameter each year. Canada St. John’s-wort (H. canadense) is an erect (up to 2’ tall), slender, well branched herbaceous plant of moist habitats. 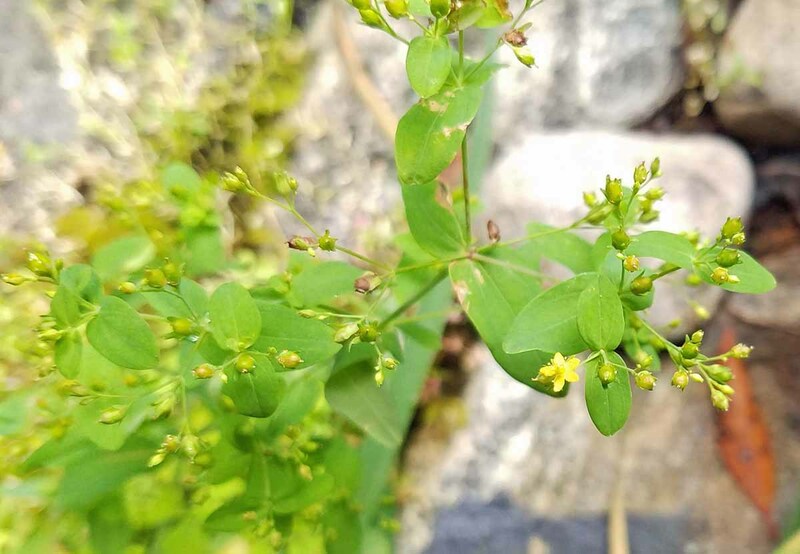 Its narrow leaves are linear, 1” long but only 1/16” wide. Its cymes are terminal and many-flowered with small blooms measuring less than ¼”. Mountain St. John’s-wort (H. graveolens) is an erect (1-2’ tall), high elevation herbaceous plant of balds & seepage slopes. The leaves are ovate or elliptic, punctate with black spots, with a base that is rounded or clasping. The cymes are few-flowered, with only 5-14 flowers/plant. The yellow petals have black glands, but only along their margins, and the sepals are usually without black lines or spots. 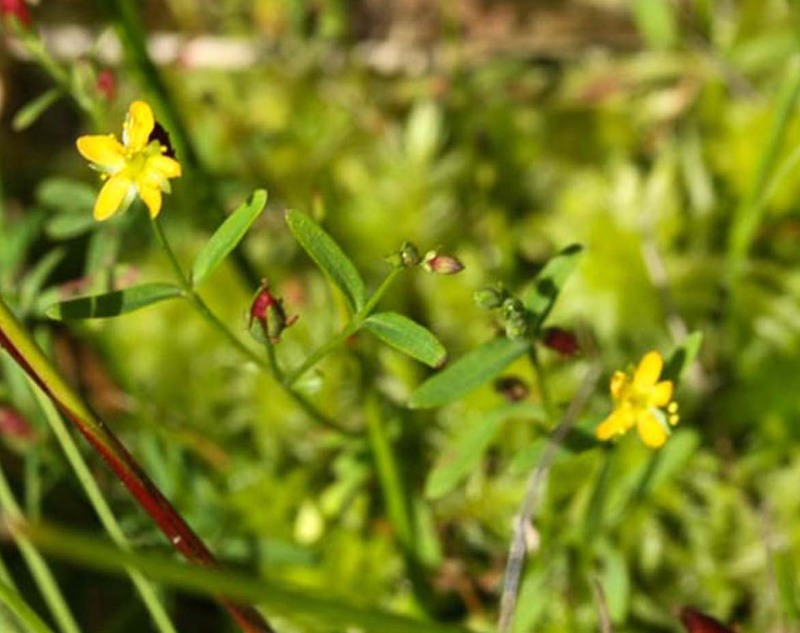 Dwarf St. John’s-wort (H. mutilum) is a slender, erect (0.5 – 2.5’) diffusely branching herbaceous plant of bogs, marshes, and ditches. Its distinctive leaves are small (up to 1.5” long), ovate or elliptic, with clasping bases. Its diffuse cymes are many flowered with small blooms measuring less than ¼”. Spotted St. John’s-wort (H. punctatum) is an erect (1-3’ tall), sparingly branched herbaceous plant of thickets and damp places. Its sessile leaves are up to 2.5” long. The flowers are in terminal cymes. The leaves, sepals, and yellow petals all have distinctive black dots. Appalachian St. John’s-wort (H. buckleyi) is a decumbent woody shrub found growing in mats on rocky cliffs and wet rocks at high elevations. A small, low growing plant less than 12” high, its leaves are elliptical to ovate and 1.5 – 2.5 times as long as wide. The small yellow flowers are solitary or in small cymes at the end of branches. H. buckleyi is very common at Wolf Mountain Overlook. Bushy St. John’s-wort (H. densiflorum) is an erect (1-3’ tall), sparingly branched woody shrub of balds and bogs. Its leaves are linear, 1-2” long and its multiple flowers (usually more than 7 per cyme) are borne in panicles at the ends of branches. This plant is also common at Wolf Mountain Overlook. Shrubby St. John’s-wort (H. prolificum) is an erect woody shrub (1-4’ tall) found growing in bogs, seepages, and dry rocky areas. The bark of older plants becomes ridged and peels off easily to reveal a pale inner bark. Its lance-shaped leaves are 1-3” long; the largest leaves being only ¼ to ½” wide. H. prolificum has a large number of long bushy stamens that partially obscure the petals (hence the epithet “prolificum”, meaning many). The terminal cymes usually contain only 3-7 flowers. The following 2 Hypericum species prefer drier conditions and are commonly found along Sky Valley Road. Orange Grass (H. gentianoides) is an annual erect (12″ tall) diffusely branching herbaceous plant of rock outcrops. Its leaves are tiny and scale-like (maybe 0.1” long). Its small flowers, measuring up to 0.3” across, are usually solitary and found in the leaf axils. St. Andrew’s Cross (H. hypericoides) is a small shrub (up to 3′ tall, although usually shorter) of dry locations. Its linear leaves (up to 1″ long) are widest in the middle. H. hypericoides differs from the other Hypericum species described above by having 4 petals, not 5. Its common name comes from the patron saint of Scotland, Saint Andrew, who according to myth was crucified on an X-shaped cross. Albert E. Radford, Harry E. Ahles, & C. Ritchie Bell: Manual of the Vascular Flora of the Carolinas. The University of North Carolina Press, 709-717, 1968. Richard M. Smith: Wildflowers of the Southern Mountains. University of Tennessee Press, 97-99, 1998. Alan S. Weakley: Flora of the Southern and Mid-Atlantic States. UNC Herbarium, 2015.